Up before the sun, Harlon is hard at work early every morning to make sure the fishermen, docks and seafood buyers always bring the best of today’s catch to LA Fish. “Seafood is a relationship business and I stand by my fishermen and buyers,” said Harlon. “My word is my bond. When I agree to buy your catch, I promise to buy it all. Whether it is a hundred pounds or a thousand, my people know they can always count on me.” Every day 20,000 to 40,000 pounds of fresh caught Louisiana seafood comes through the doors of Harlon’s LA Fish. Restaurant and wholesale customers know that the commitment Harlon’s LA Fish makes to customer service is supreme. “I won’t take on a customer that I cannot supply everyday,” said Harlon. “It is vital that my customers know they can count on me on a daily basis. I’ll get them what they need, when they need it, no matter what it takes.” This commitment to customer service is just one of the reasons the finest chefs and restaurants choose Harlon’s LA Fish to supply their seafood. Every order from Harlon’s LA Fish is traceable back to the point of origin. “We track all of all our products through Vendor Verified Trade Tickets,” said Harlon. “We follow our products from start to finish. Where did it originate in Louisiana? Which fisherman? Which dock? We buy the best products from the best people and it’s documented every step of the way.” Through this rigorous process Harlon’s LA Fish ensures that their product is fresh, safe and of the highest possible quality. Harlon’s LA Fish guarantees their customers that their seafood is held, processed, and delivered in a completely sanitary and climate controlled environment. Every fresh filet prepared by Harlon’s LA Fish is immediately vacuum-sealed. Vacuum packaging preserves product quality and storage. Because oxygen enables microorganisms, such as bacteria, mold and yeast to grow, which then causes seafood products to deteriorate, the removal of oxygen in the vacuum packaging process is of the utmost importance. 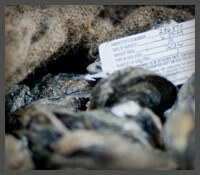 The process also protects the seafood from damage during handling and becoming waterlogged while on ice. This extra step in preparation is just another reason Harlon’s LA Fish is a premium seafood selection. The meticulous care Harlon’s LA Fish takes with all of their seafood products can be seen in the tons of ice they produce each day. Inside an icemaker the size of a two-car garage, chunks of ice fall from the ceiling on to an ever-growing mountain used to keep tons of fish ready for filleting and packaging. This chunk ice lasts longer and melts slower than the flake ice used by other companies and stays drip free in coated transport boxes. Always precise, even when it comes to ice, Harlon’s LA Fish promises the best and always delivers on that promise. 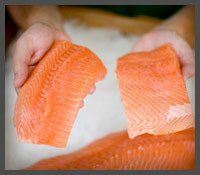 There is no other fresh food product as time sensitive as seafood. From the boat, to the processor, to the table; the clock is always ticking. Harlon’s LA Fish is located in the perfect spot to take maximum advantage of every opportunity. Close to the docks and the city of New Orleans, yet right next to New Orleans International airport. 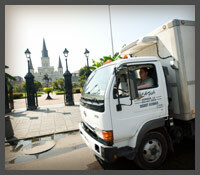 Local orders get same day delivery in our refrigerated trucks. UPS makes special arrangements with us so that your seafood goes straight from our plant to the shipping terminal at the airport. Just like real estate, in the seafood game it’s all about location.